Challenge accepted. Lisa and I get started. 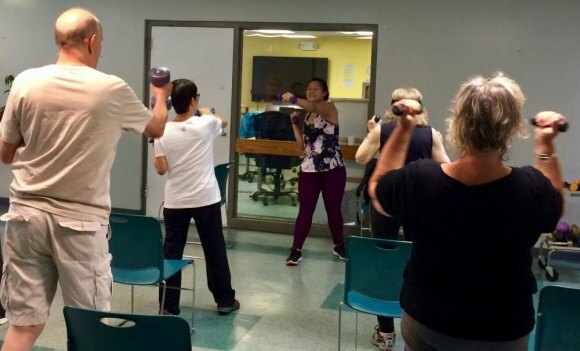 Accepting CBN/RI Senior Center Director Lisa Fernandez's challenge to workout, side by side, in Linda Nguyen's Total Fitness class, I showed up Monday morning, ready to rock. Consensus is that Lisa beat me out, but I'm not conceding. The reason she won...? Her "claim" that she had to run the Senior Center and exercise at the same time and did both without a hiccup. Big deal. First, Linda Nguyen explains why Total Fitness may be just right for you. Except, as we all know, women stick together. I was actually outnumbered. Lisa takes a swing at our instructor. Intimidation? You decide. Nguyen's class was 45 minutes of fun as she cheerfully led us through warmup aerobics, stretching, weight work and combination exercises. Her routine gets you worked out from your feet to the base of your neck. In truth, the music and rhythmic footwork probably gave our brains a pretty good challenge too. Discovering that I may have two left feet probably counted against me. Arranged with intervals of less intense effort, the workout was not exhausting, and 24 hours later, I can tell you it left me without any pains either, a real bonus. Who's doing the exercise correctly here? You decide. 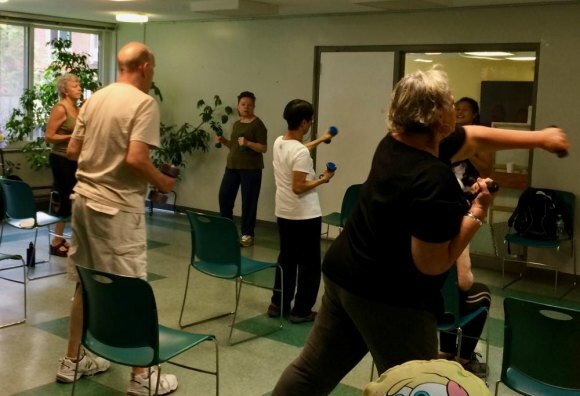 Although I heartily recommend that any senior try Total Fitness with Linda Nguyen, held on Mondays and Wednesdays at the CBN/RI Senior Center, 546 Main Street, from 10:00 to 11:00, the final 15 minutes being cool down and social time. 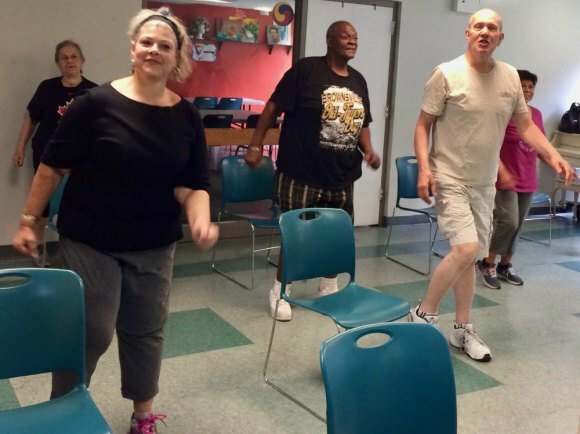 Lack of physical fitness increases age-related risks. Loss of muscle and/or stamina sets off a chain of potential hazards. Don't let it happen to you. Total Fitness with Linda Nguyen will yield benefits far beyond the time spent exercising. P.S. : I'm joking about Lisa Fernandez cheating. She won fair and square. She really did handle management demands while hardly missing a step in the workout. I concede.